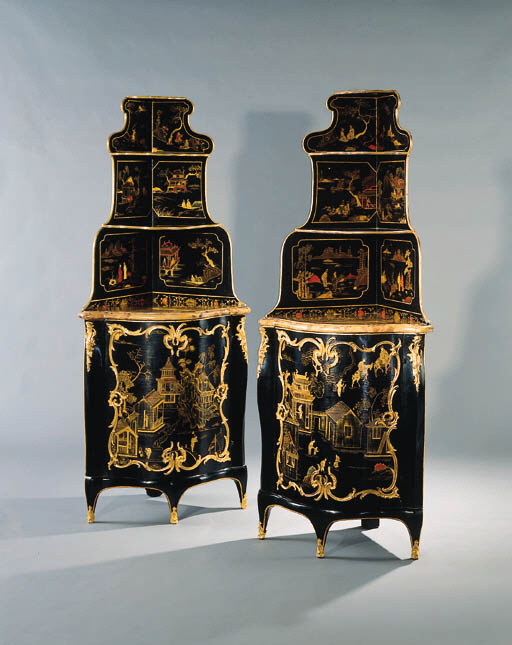 Encoignures were a popular and fashionable furniture form during the Louis XV period, and were usually produced in pairs with matching commodes. Encoignures à gradins, integrally incorporating a shelved superstructure, were much more rarely produced. It became common to place freestanding shelves, often of a matching design, above encoignures, yet it it is unusual for theses shelves to survive with their original cabinets. Lazare Duvaux, the celebrated marchand-mercier, recorded in his daybook as having delivered to Madame La Comtesse d'Egmont on December 8th, 1750 "des encoignures de bois violet 192 L les gradins 54 L, and for Madame de Pompadour, "quatre corps d'encoignures pour la garde robe d'en bas, en vernis... 4 gradins au dessus même vernis 210 L". Few surviving examples of encoignures à gràdins are known. One stamped E. Doirat in amaranth and mounted with Chinese lacquer panels is in the collection of the Hermitage Museum, St. Petersburg (illustrated in Biriukova, ed., Decorative Arts in the Hermitage, Leningrad, 1986, pl.169). A further pair of encoignures à gradins is in the collection of the Musée Carnavalet in Paris. Ormolu mounts of the same model as those found on this pair of corner cupboards also appear on a pair of encoignures stamped I DUBOIS reproduced in J. Nicolay, L'Art et la Manière des Maîtres Ebénistes Français au XVIIIe Siècle, Paris, 1976, p. 161, fig. D.